It's always fun to take the whole family to amusement parks, where rides big and small bring hours of fun. For the youngest family members, carousels are a big draw, with their soundtrack of calliope music filling the air. Here's a listing of Long Island's amusement parks, rides, and twirling carousels. Many are open year-round with limited hours during the winter. Opened in 1962, Adventureland Amusement Park in Farmingdale features thrilling rides like the Hurricane Coaster, Pirate Ship, and Ghost House. For the kids, there are tamer rides like the Flying Puppies and Kiddie Carousel. There are water rides, too, like Adventure Falls, where you'll zoom down a river, and Crocodile Run, where you stand atop an artificial reptile as it spins and swirls in the water. Please note: No smoking or alcoholic drinks are allowed. No open-toed shoes or flip-flops on rides. There is no admission to enter the park, but you must pay for rides. From Bradley Bay's Rock Climbing Challenge to the Jungle Tree Top Adventure, Bungee Bounce in the Adventure Dome and other thrilling experiences, Bayville Adventure Park offers exciting rides, miniature golf, an indoor arcade, and much more, all across the street from the beach. During Halloween, the amusement venue turns into Bayville Scream Park, and you can also hold your child's birthday party here. Boomers! Long Island in Medford features Go Karts, Bumper Boats, Kiddie Rides, a rock wall, batting cages, and miniature golf. This family fun center is open year-round, but during the winter, outdoor attractions are closed and the indoor park is only open on weekends and days when schools are closed. 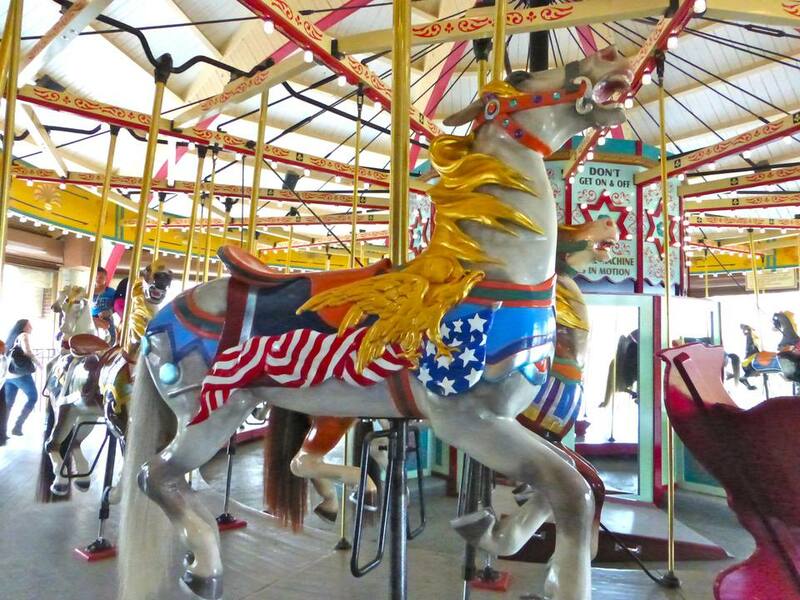 The Greenport Antique Carousel is housed in an enclosed, all-weather Glass Carousel Pavilion in Mitchell Park, which spreads out over four acres overlooking Greenport's scenic harbor. The carousel was built in the 1920s and was donated by the Northrop-Grumman Corporation in 1995. The carousel is open daily during the summer. During the off-season, it's open on weekends and holidays. This vintage carousel, built in the early 1900s, was carved by master carousel builder M.C. Illions in the Coney Island style of woodcarving. Featuring 36 horses and two chariots, this beautiful, moving work of art was fully restored in 2004. It's available for rental for a fee for birthday parties and other events. It's in Hempstead Lake State Park in West Hempstead. Built in 1912 by the Stein and Goldstein Artistic Carousel Co. of Brooklyn, Nunley's Carousel in Garden City has been lovingly restored and boasts 41 horses and one majestic lion. It's a magical venue for a child's birthday party. The Travel Channel had good reasons to name Splish Splash in Calverton one of the Top 10 Water Parks in the U.S. Open from Memorial Day until Labor Day, the water park features thrilling rides that include Dr. Von Dark's Tunnel of Terror, where you and the kids can catapult down a 40-foot drop, soar high and complete 360-degree spins...all in complete darkness! Kids will also enjoy rides like Alien Invasion's rafts racing down an enclosed tube, Barrier Reef's 80-foot speed slide, and Dragon's Den's double tube ride. Seasons passes are available if you want to make this more than a once-a-summer outing.